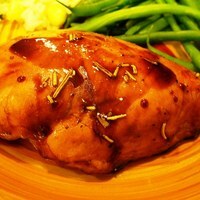 I really liked the marinade/glaze and its rosemary and balsamic flavors. If preferred, substitute boneless skinless chicken breasts and/or thighs or other chicken parts (baking time for smaller or thicker pieces will need to be adjusted.) This recipe will lend itself to your busy schedule: (1) Marinate the chicken in fridge while you attend to other tasks, then (2) Pop it in the oven to bake while you prepare the sides and salad, or get back to your to-do's. In small bowl mix together honey, vinegar, oil, rosemary, salt and pepper. Measure half of marinade into a plastic zip-type bag; set aside the remaining half to use as a glaze or sauce after baking. Place chicken pieces into bag, seal, massage to distribute marinade evenly, and refrigerate for at least 1 or 2 hours, turning to coat occasionally. Preheat oven to 350 degrees F. Drain and discard marinade in bag. Place chicken pieces (bone side down) on greased baking pan 13" x 9" or larger, as needed to accommodate chicken. Bake uncovered about 50-65 minutes (depending on chicken thickness.) Drizzle chicken with reserved marinade, and serve. YIELD: Serves 6-8. I made a HALF recipe using 3 boneless/skinless breasts (total weight 1.5 pounds) which served 4 easily. What temp do I cook this at.. Im guess 350*? Thanks for pointing out that I had not posted the setting. I corrected the recipe to 350 degrees. You're welcome. I made this for a very picky family...other than it being a bit to vinegary for them they like it. Thanks for the dish. My kids loved it. Looks delicious, thanks for posting. The primary photo really makes it look GREAT !